TJ's has always loved throwing raw ginger into products. The Ginger, Almond, and Cashew cereal comes to mind. Or, you know, they might just give us a bag of nothing but ginger. Don't worry, the ginger level in this product isn't quite that extreme, but it's certainly headed in that direction. 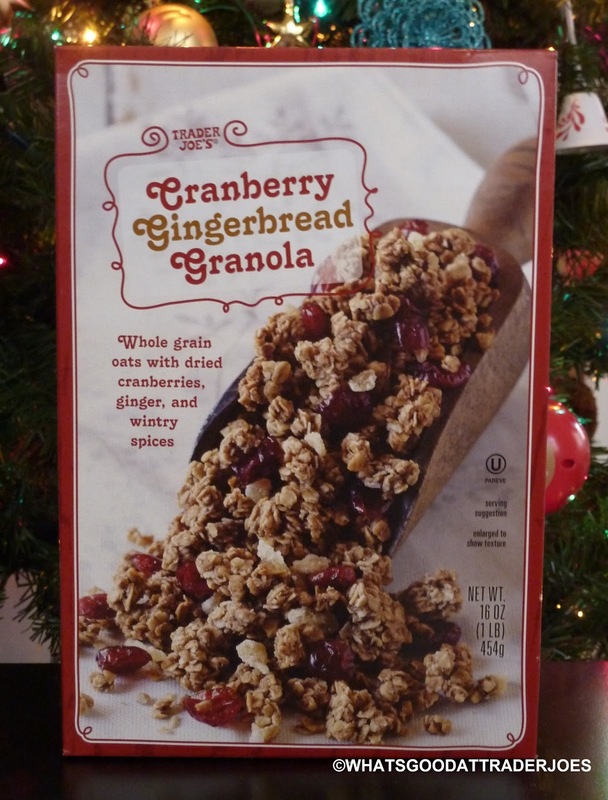 In fact, that's the dominant flavor I'd say—more than gingerbread, cranberry, or oats. Good news for gingerphiles. Uhhh, no. Not that kind of gingerphile. 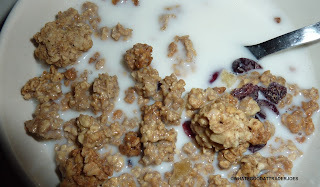 I saw plenty of cranberries in the mix, but I, personally, wouldn't have minded some more. Flavor-wise, their sweet-tartness didn't do much to offset the gingeriness. In general, I'm loving this trend where we're seeing lots of cranberries in different Christmas items. But in this case, and in the case of another recently-reviewed item, I'm always wanting more cranberries than these products offer. Uhhh, no. Not that kind of cranberries. On a more positive note, this granola is very filling, energizing, and works reasonably well as a cereal or yogurt topping. All in all, it's not bad, particularly if you're into that raw gingery flavor, but I'll probably go back to more traditional granola as soon as this box is done. 3 stars from me, 3.5 from Sonia. Here's a link to the nutrition info. And as always, your opinion counts, and we love to hear it. Leave your comments below, por favor! Eating it myself now! Reminds me of pumpkin things, just fun for the season then back to normal stuff. So good though! Yeah not sure I'd want to have it every day, but it's not bad for the holidays. Sampled it today. I love ginger but this was nothing special in my opinion. Did buy a box of ginger oatmeal to try though. Let us know how the ginger oatmeal is, Kris! I liked it well enough, but i'm ok with one or two boxes a year.